There were a couple pictures over on the DIS FB page. One had a 30-40 min at Figment!!! The other showed the very crowded walkway around Philharmagic. It’s been busy. Far busier than this week the previous two years. We have good plans though, so it’s manageable. mi*vida*loca and twoolle like this. We were in MK on Saturday and we made additional FPs all afternoon and evening until 9pm. Refreshing worked very well! We had good luck in Animal Kingdom on Sunday, too. Epcot was crazy on Monday- we didn’t stay very long, but I was able to move up FPs to get us out of there sooner. Overall much busier than I was expecting, but I wasn’t totally surprised. We had our first park day yesterday in AK. We had FPs for FOP at 1:10, Safari at 2:20 and EE at 3:40. We wanted to ride EE a few times (single rider for extras) and PW (using FPx2) and Dinosaur (FP). Ended up also riding KRR, photos with launchpad and Donald and Mikce/Minnie (FP). We arrived at the park around noon and left at 7:30 including 2 meals (Satuli Canteen and Pizzafari Family Style Dinner). twoolle and mi*vida*loca like this. We’ve been here since Friday. Yes it’s crowded and busy but with a good plan and FP+ we’ve done everything we’ve wanted plus more. We did EE five times in one day, splash multiple times, TOT, RnRC, 7 dwarves. All multiple times. Getting additional FP has been hit or miss but mostly hits 90% of the time. Last night in MK from 7-10 we saw additional FP for space, splash, HM, pirates, PP and many more. We’ve stuck to RD (we arrive ten minutes before opening), midday pool breaks and PM park. It’s been working like a charm. Also don’t go by posted wait times. I’ve been using the touring plans app. Yesterday FOP had a posted time of 180 minutes. TP said it was truly 88 minute. We had a FP so didn’t do stand by. But we’ve done other rides with big posted times since TP said it was lower and they’ve been correct. Just curious if anyone with a TP subscription could tell me what they predict crowd levels to be for the last week in November/first week in December. I subscribe to character locator which is telling me it’s a low crowd week until 12/1, but all of the hotels are sold out pretty much. Just makes me nervous. I’ve read that the true test of jersey week starts today since schools are officially off tomorrow so the crowds pick up more today. We shall see. Wednesday was our DHS day. We had FP for Slinky Dog (12:15), RnR (3:10), and Indiana Jones (4:45 show - so seated by 4:30). We also had lunch at Sci Fi at 12:45 and JBJB Dessert Party at 6:45. We did not rope drop - and I took a photo of the DHS entry all decorated for Christmas at 9:56. I would never advocate arriving at this time unless you are a park regular - we spent forever in the bag check lines! I think we parked around 9:20 for perspective..
We stood in line for photos with Donald (one of my daughters homework assignments!) and watched the Storm Trooper march and then headed to Toy Story Mania and were in line by 10:20. It said a 65 min wait and it was longer...we played a lot of Heads Up in the line!! We were off around 11:45, strolled around TSL, watched the alien saucers a bit (we had been on mater in DCA before), and then sat on the ground for a few minutes until 12:10 for our FP. The FP line was SOOO short - we were off at 12:18! We took some photos and headed to Sci Fi for lunch. At 1:45, we got In line for Santa Goofy which was until 2:05 and then we wandered around muppet courtyard a bit before hopping in line for Star Tours. Posted 15 min wait - it was 17 min...pretty reasonable. We were done at 2:40. Stopped for photos at the tree, had to watch/wait for another storm trooper match and then headed to our RnR FP. My daughter decided she didn’t want to go on RNR so my son and I went twice. FP line was non- existant so we were thru really fast. The wait for TOT was 65 min so we pushed that until later knowing it would drop a lot. Next..Posted 20 min wait for Santa was 35 in the end but we finished - he was a great Santa - and made it to Indiana by 4:25. After the show - we grabbed FP for Star Tours - we used them but the posted wait time was 5 minutes. We split up for a bit next - sending my son and husband to ride TOT and my daughter and I to check in for the party, take some pictures, and watch the Sunset Greetings shows. We all watched together for a bit and then headed to JBJB for 6:45. Overall - we did everything we wanted to. Having been multiple times this year we werent trying to fit in launch bay, little mermaid, frozen show etc. We could have done those things had we ripe dropped TSM and used Luttle Mermaid as our 4th FP instead of Star Tours (it was available), I’m sure. (I did try to get TOT as a FP at 4:45pm for about 10 min of refreshing but couldn’t get one), but I knew lines were dropping and they would have no problem getting on it walk on. It was posted as a crowd level 2 day on TP...a Moderate on KTP...just looked and TP says the ‘actual’ level was a 3..
We were at Epcot on Monday and it was total madness! We'd hopped to Epcot Saturday night not expecting much, but thought we'd watch Illuminations and I'd snagged a late night FEA FP. It turned out not bad at all in terms of crowds. Granted, we were there near closing, but there were tons of places to watch Illuminations, even places to sit. With it being F&W, and a Saturday, and Race Weekend, I was very pleasantly surprised. Even sucked it up and waited about 20 minutes for Spaceship Earth, just to get a long ride out of the way and have something to do while waiting for our FEA FP window. Monday was a whole different story. Again, we were park hopping and I had an evening FP for Soarin. We came in from the IG around dusk, and with only two security lines, there were easily 50-75 people in each line with everyone having to wait and go through the metal detectors, even without bags. We finally made it through, but getting to Future World was like swimming upstream. The walkways were full from one side to the other, and sometimes it was like a wave of people walking towards us, filling the entire path. When we finally got to Soarin, we waited about 25 minutes in the FP line because the ride had gone down earlier. 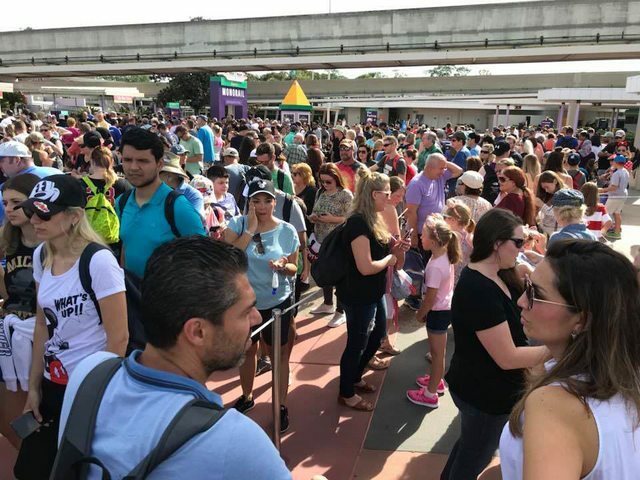 The CM said the ride was just getting back up, and with all the FP people to clear through, he expected the posted SB queue to jump to over 90 minutes. I snagged another Soarin FP while waiting (maybe dropped by someone who didn't want to wait in the FP line). Ate dinner at Sunshine Seasons because no way was I going anywhere near the madness of WS unnecessarily. I was hoping to see Illuminations again, but after walking through WS crowds to get to FW, my kids were not at all interested in going back there. With a great deal of refreshing, I got a FP for Mission Space, and then hopped into line at TT just before close. The waits were crazy everywhere, so we didn't do any standbys, not even Figment. Touring Plans said the actual crowd levels for that day turned out to be a 9, but that number only considers ride wait times between 11am and 5pm, so basically Future World during the afternoon. Clearly, many more people arrived to enjoy WS in the evening. The fact that Magic Kingdom closed at 4:30 for a CM event was probably a big driver of crowds, too. WS was madness in the afternoon, too. We made our way to FW via the IG and I had nearly had enough of that place before we made it to TT for our FP. It was awful. We left much earlier than planned. Wait times were crazy high, but it felt much more crowded in WS. I don't like people anywhere near enough to battle those crowds. disneysteve, Searc and ClapYourHands like this. We were at DHS yesterday, too. We had SDD FP for later, so figured we'd be okay getting there right at opening. We also found bag check time-consuming, but arrived at the entrance to TSM by 9:05...to find an 80-minute line posted. EEK!!! I asked the CM, and she confirmed the 80 minutes was correct because only one side was running, and she didn't know when the second side would come back on. So much for smugly walking past the 90-minute SDD line. So we bailed on TSL and rode RnR, ToT, and Star Tours, each with about a 15-minute wait. We are at Disney now. The crowds have been significant. This is aggravated by the fact that last weekend was a race weekend and this weekend is the end of Food and Wine. Monday morning we waited in traffic for 30 minutes just to get to the Epcot toll plaza and the park was packed. Tuesday we were in line for over 30 minutes to board the monorail to MK at the TTC and the park was packed. Even worse is that it's been super hot with mid-day temps in the mid to upper 80s and high humidity so that's making it pretty miserable all around. We've bailed from the parks a few times due to the heat and crowds. So go a week later! You just say "we are celebrating his birthday today!" and you can still get a pin or whatever. Skip the crowds! I feel like I must be at a different Disney than those of you saying crowds were significant...when was the last time you were here? What is your measuring stick? Sure - it’s crowded compared to 6-8 years ago, but it’s right on par with our trips the last few years in April/Fall..
Interexfing about Saturday night,..I expect that’s racers and their family going to bed early and the fact that MK was actually open and not a party night? We come 2 or 3 times a year and I've been coming since 1978. I think we have a pretty good idea of relative crowd levels. I have NEVER waited in a 30-minute line of traffic to reach the Epcot toll plaza until Monday. I have NEVER waited over 30 minutes to get on the monorail to Magic Kingdom until Tuesday. We left Hollywood Studios yesterday afternoon because it was just too crowded and too hot to do anything. I think we've spent more time not in the parks this trip than ever before. Here's a picture of the line for the monorail Tuesday morning. Ngwira and tinkerbella16 like this. We were also in Animal Kingdom the other day (I forget which day) and did single rider for Everest and waited about 25 minutes. That's the longest wait we've ever had there for the single rider line. We've been discussing Monday at Epcot. And according to Touring Plans, it was a 9. That's a pretty objective measuring stick. And even that doesn't account for anything in World Showcase other than FEA, nor does it account for evening crowds, which were enormous. I was still able to get a lot done, thanks to good planning. Other parks on other days have been much more manageable. In fact, I spent that Monday morning and afternoon in MK where the crowds were low - no problem getting additional FP for the mountains, good parade sightlines last minute, enough room to walk around, and reasonable SB waits (except for Jingle Cruise where we waited 30+ minutes after entering the queue with a posted 15 minute wait). I expect DHS and AK were probably somewhere between those extremes on Monday. This is an important point. Some people judge crowds based on attraction wait times. Others judge more by how crowded the park feels when walking around. We fall into the latter group. If the walkways and stores and restaurants are packed, we just don't enjoy ourselves no matter what the attraction wait times are like or how easy it is to get FPs. 100acreHiker, ClapYourHands and WishUponAStarryNight like this. I think this year feels busier than the last 2 years during Jersey Week, but that may be because Touring Plans lowballed the crowds for this week. I went the week before Christmas last year, and this was definitely busier. But it’s light compared to Christmas week.